The Equine Herbalist started in Epsom in 1996, supplying local racehorse trainers and stables with herbs for horses, later progressing into custom made products. Word of mouth spread and soon we were receiving calls from all over the UK. In July 2003, we launched our on-line store supplying the whole of the UK and relocated to Somerset, the home of cider vinegar. By 2006, we had grown from supplying local horse folk to a nation wide business. Time had come to register our trademark and set up Epona Herbs Ltd. Inspiration for our company name came, as Suzanne looked across the hills towards Westbury, from the Mells Road leading to Frome. 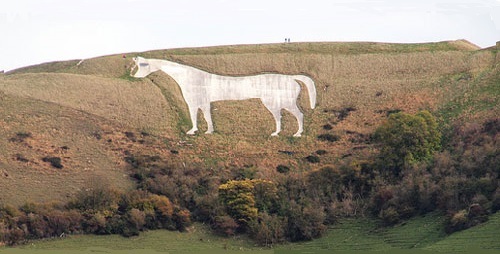 The white horse at Westbury loomed brightly, the name had to be "Epona Herbs". Our products are formulated by our fully qualified medical herbalist Suzanne Woodward DBTh MRH, MURHP, a member of the Unified Register of Herbal Practitioners and The European Herbal Practitioners Association. Suzanne is a graduate of Dominion College, the leading herbal college of North America, known for famous herbal students such as Jethro Kloss and Dr Christopher. In the UK, Suzanne furthered her studies with the late Dr. Hewlett Parsons and obtained her Diploma in Botano Therapy from the General Council and Register of Herbal Consultants (now the IRCH), in 1994. Over the years, customers have requested products to meet the health needs of their horses, we have listened to their requests. Many custom products became so popular they became stock items such as Headshaker. When our famous Headshaker product was added to the site, demand was phenomenal simply because it actually worked. We can honestly say all our products have evolved over the years, due to our customer feedback and trials, into our quality products. Unlike other feed supplement companies supplying herbal feed stuffs, our products have been developed from sound herbal knowledge, extensive research into herbs beneficial for equine feeding and our experience working with horses. We have built up a wealth of info on "Herbs for Horses". What herbs work well together, herbs horses instinctively like, herbs with clinical trials proving their efficacy, herbs poisonous to horses (not necessarily to humans), contra-indications with other herbs and allopathic (Vet) medicines, correct doses etc. All this knowledge we are putting together in our Herbal Handbook for Horses.